With the fall of Atlanta, and with Robert E. Lee pinned down in the trenches around Richmond and Petersburg, things looked grim for the Confederacy. The only hope seemed to fall on the shoulders of General John Bell Hood and the hard-luck Army of Tennessee. There weren’t many options that could lead to victory. But on September 29, Hood set forth on a new campaign—one that was designed to do something other than follow a path that led to surrender. Hood decided on a plan to strike at Sherman’s lifeline in North Georgia, retracing the route of the Atlanta Campaign in reverse to try to draw Sherman out of Atlanta and, perhaps, onto a field where Hood could deliver a fatal blow and maybe regain what had been lost the previous spring. Maybe he could even reclaim the heartland of Tennessee. 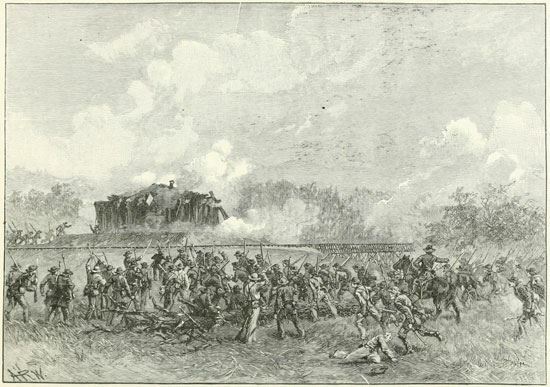 Hood’s campaign in North Georgia is largely forgotten, consisting of a series of small, but intense engagements and micro sieges with Union garrisons along the Western and Atlantic Railroad. The first of these took place under the shadow of Kennesaw Mountain on October 3 and 4 at Big Shanty, Ackworth, and Moon Station. This entry was posted in Battles, Campaigns and tagged 14th Illinois Infantry, 15th Mississippi, Ackworth, Army of the Tennessee, Atlanta Campaign, Big Shanty, Daniel Reynolds, John Adams, John Bell Hood, Moon Station, North Georgia Campaign, Pat Henry. Bookmark the permalink. At least once a year the Internet comes out with lists of things like The Ten Most Popular Baby Names. Never once have I seen Marquis De LaFayette listed. Or, for that matter, States Rights. The 19th century cannot be beaten for names.